Arli$$ gave HBO its first foray into the sports agent genre, now occupied by Ballers. With TV looking into the past for reboots (Roseanne, Magnum, P.I., Murphy Brown, Will & Grace, etc., etc. etc. ), there’s one show that could certainly be updated today without too many issues. That show is HBO’s Arli$$, which had a seven season, 80-episode run from 1996 to 2002. The entire Arli$$ library is available for streaming now on HBO Now, HBO Go, and HBO On Demand. 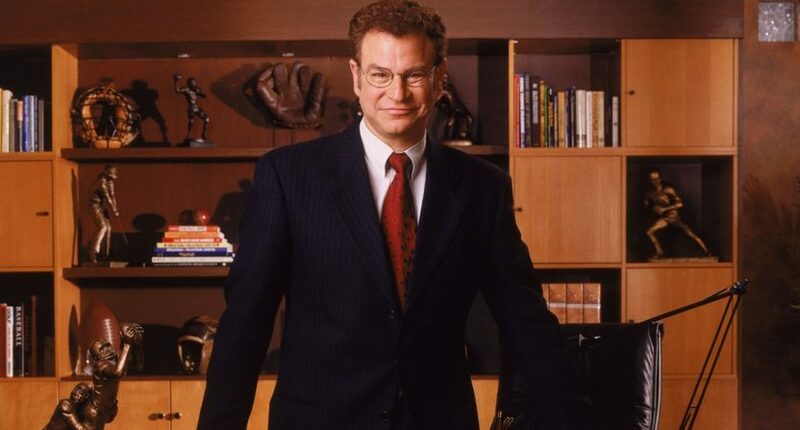 Arli$$ was a show about fictional sports agent Arliss Michaels (played by Robert Wuhl), who headed Arliss Michaels Sports Management while schmoozing clients and trying to maintain a profit for his agency. It had a strong supporting cast, including Sandra Oh (Rita Wu), Jim Turner (Kirby Carlisle), and Michael Boatman (Stanley Babson). And what about this promo before the series ran with a young Barry Bonds? The cameos on that intro included Al Michaels, John Elway, Derek Jeter, Dan Marino, and Jimmy Johnson, and those cameos helped to give the show immediate credibility. It took the movie Jerry Maguire, which was about a sports agent, even further. The idea behind Arli$$ was to show the hype of Arliss Michaels and to document what really happened behind the scenes. Wuhl: There were so many who did a great job: Picabo Street, Katarina Witt, Marion Jones, Alexi Lalas … People who got it were those like David Wells. Barry Bonds was OK. Kobe Bryant was good. Shaq was great. You could see his acting chops. Tollin said the only athletes who canceled were former Dallas Cowboys quarterback Troy Aikman and former Yankees outfielder Bernie Williams. But overall, if you watched the series, the cameos from athletes gave sports fans an aura of authenticity. Could Arli$$ return today? It certainly could and with Wuhl’s connections in sports, the current day cameos would be fun to watch. However, Tollin and Wuhl admitted they haven’t talked about it, but both think a revival could work today. Tollin: We haven’t any discussions on that. Wuhl: No, but we can hope. There are so many topics still to go after. Look, an NFL player just retired in the middle of a game. Players are telling you which teams they will accept going to now. And you’ve got [scandals] at Ohio State and Penn State. Sports is so much bigger now. And while Arliss Michaels would certainly be back, it would be interesting to see what happened to Rita Wu, Kirby Carlisle, and Stanley Babson. While the supporting cast has gone on to bigger and better things (Oh with Sideways, Grey’s Anatomy, and Killing Eve; Boatman with The Good Wife and The Good Fight), updates on their futures could work out well. Yes, HBO has the sports agency genre filled with Ballers, but its storylines pale in comparison and their cameos aren’t as strong as Arli$$. If you never got the opportunity to watch the series, it’s available for streaming on HBO’s various platforms. Wuhl himself raises the possibility of the show coming back down the line, and with all of the reboots we’re seeing on air today, why not Arli$$?